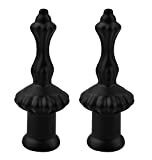 Save on Lamp Finials at UCBC Group. Top brands include Urbanest, Whitehall, Westinghouse, Dysmio Lighting, & Old World Distributors. Hurry! Limited time offers. Offers valid only while supplies last. Utopia 27" cast aluminum finial.